Belatedly, the quarter-chomping arcade game makes its way to the big screen, but with better-than-expected results. The ’80s arcade classic Rampage allowed players to inhabit the avatars of rabid mutant animals as they punched helicopters, ate people and demolished cities. That premise is a bit obvious for a major studio feature, but star Dwayne Johnson and director Brad Peyton, improving on their 2015 lemon San Andreas, have taken the title and basic thrust of the video game (smash things!) and delivered a colorful, cornball disaster spectacle. 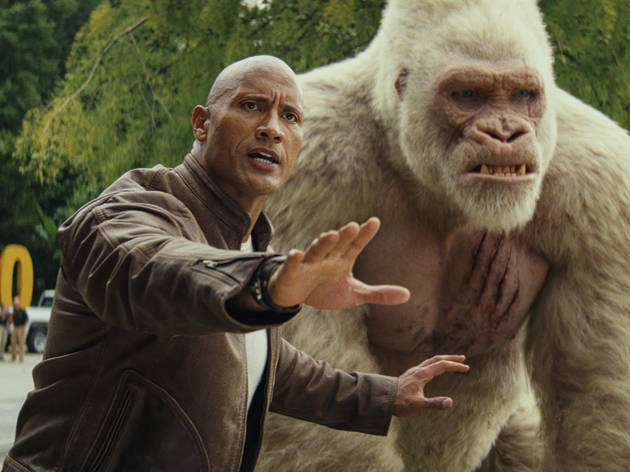 Rampage isn’t cause for wild celebration, but with its bright, coherent FX—rare in this genre—and one deliriously fun supporting performance, it’s better than it has any business being. The movie opens with a knockout action sequence, set aboard a space station that’s been overtaken by a gargantuan lab rat. (For fans of the video game, this rodent is the first of several Easter eggs.) The pathogen that’s loose in the space station, which turns animals into supersized killing machines, makes its way back to Earth and is ingested by a crocodile, a wolf and an albino gorilla named George. 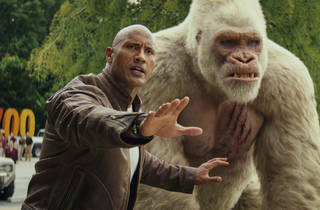 This simian star provides an emotional element, via friendship and sign language with primatologist Davis (Dwayne Johnson, doing his thing), and sets the story in motion when he destroys a wildlife sanctuary on his way to a rendezvous with his fellow mutants in Chicago. Johnson joins with Naomie Harris, radiating smarts as a genetic engineer, to quell George and minimize the damage. Good luck with that: The annihilation of the Windy City is a thrill to watch—cartoonish enough to avoid real-world implications but chock-full of broken glass and concrete to satisfy our appetite for destruction. The plot grinds through a handful of inept scenes involving two bumbling Boris and Natasha–type villains (Jake Lacy and Malin Akerman), but is injected with adrenaline by the appearance of The Walking Dead's Jeffrey Dean Morgan as a smooth-talking government goon, self-described as "the guy who comes to change the sheets" when science poops the bed. Morgan's performance is a gem of comic timing and audience-directed winks. He elevates a movie that’s mostly about watching stuff get stomped down.